The Twins of Evil Tour featuring Marilyn Manson and Rob Zombie should have been called the “10 Years Too Late” tour. 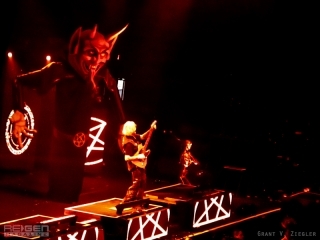 Reliant Arena in Houston, Texas played host to the widely anticipated tour and that particular October 30 show was the fastest sell out of all the Twins of Evil stops. Hype and anticipation aside, the show didn’t deliver. After Jonathan Davis of KoRn – a.k.a. 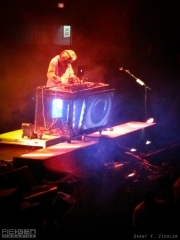 J-Devil as his DJ moniker – bowed out of the tour due to medical reasons, DJ Starscream, turn-tablist for Slipknot, opened the show with an out-of-place DJ set. 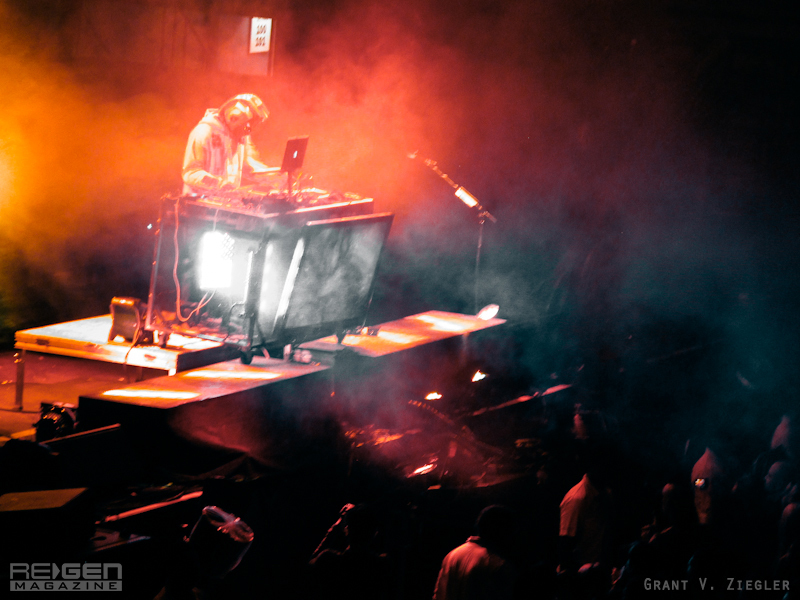 In this reviewer’s opinion, the DJ set just didn’t belong. When the main selling point of a tour is focused around music that is intended to be macabre, evil, and whose purpose seems to be about rebelling against your parents, why play a techno based DJ set for a bunch of metalheads? DJ Starscream is excellent at what he does; the mixture and flow of the music he plays is flawless. 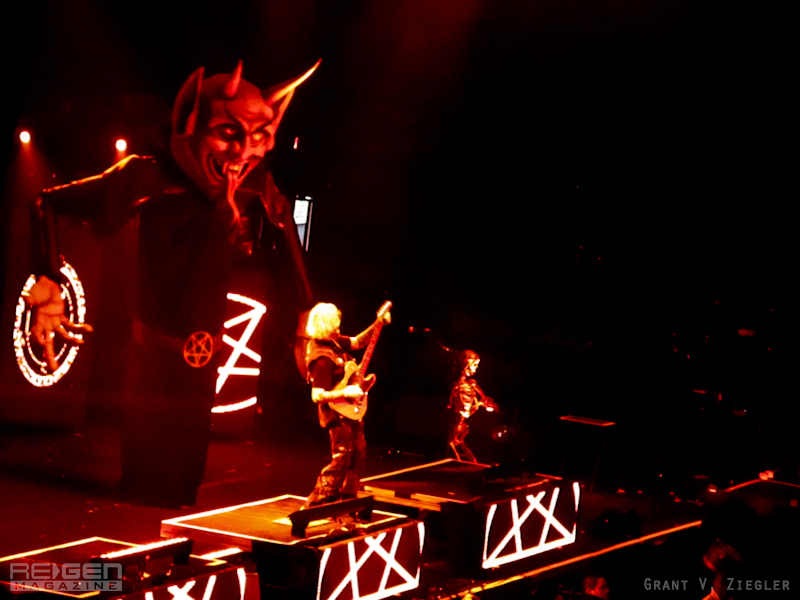 However, it did not belong on the Twins of Evil tour. Following up was the self-proclaimed Antichrist Superstar, Marilyn Manson. Manson himself has admitted that his latest album Born Villain and previous Hey, Cruel World tour were comeback efforts on his behalf. Even though many feel Born Villain redeemed Manson for Eat Me, Drink Me and The High End of Low, his tours continue to suffer, largely in part due to his onstage inebriation, which he proudly boasts about while speaking between songs. The set list was almost identical to Manson’s previous tour. The only differences being they added “King Kill 33” as a prelude to “Antichrist Superstar” and cut out “Pistol Whipped” in favor of “Coma White.” During the entire set, Manson practically screamed his lyrics. Little, if any, vocal distinguishing occurred from song to song. 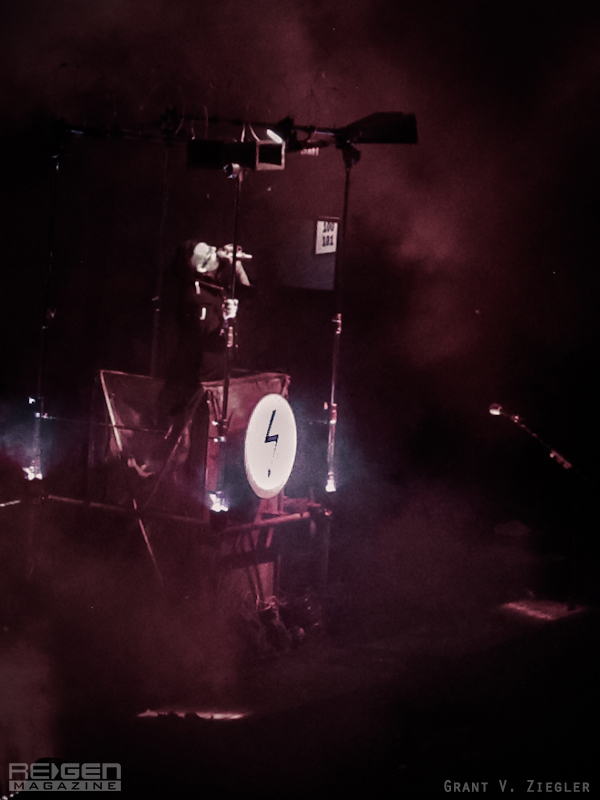 Manson brought back some old props including a bishop’s outfit during “Love Song” while continuing to use a podium for “Antichrist Superstar.” He lazily flailed about a fog machine attached to a light, possibly to give the stage some ambience but mainly just seemed to suffocate security and fans near the stage. Electing to go with “Coma White” in the set was a good decision, however, as it allowed Manson to stand still during an emotionally dark and beautifully haunting song. When Manson did move around, it could be deemed as embarrassing. During “Personal Jesus,” Manson actually grabbed one of his platform boots with one hand and hopped around onstage like a dancer pretending to be horrible at dancing. Highlights included “No Reflection” and “The Dope Show,” which seemed to get the crowd pumping more than any of the other tracks. Overall, Manson’s performance was boring and lackluster. 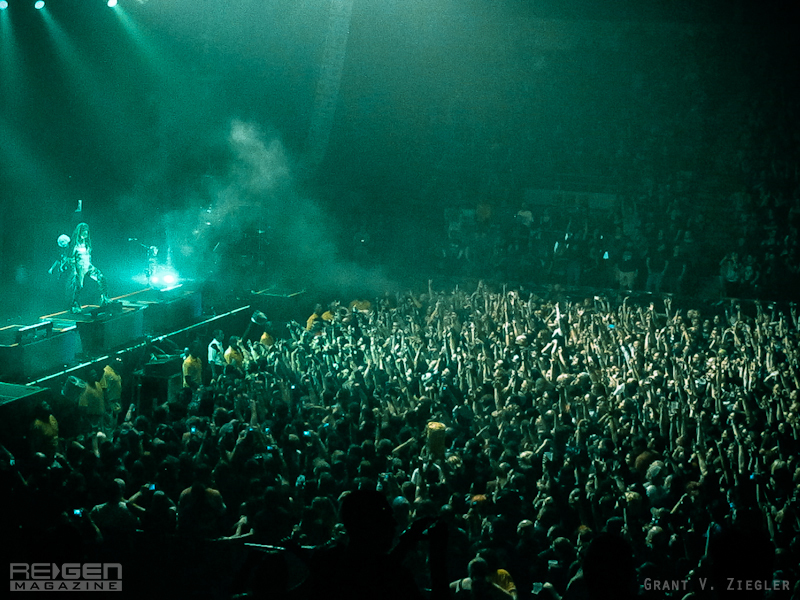 The predominantly Rob Zombie based audience seemed to agree. 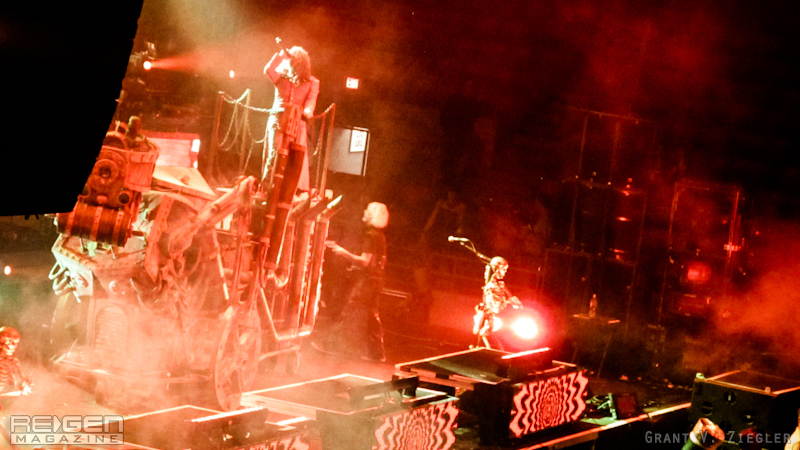 Headliner Rob Zombie came prepared with different gimmicks and more metalhead friendly music. 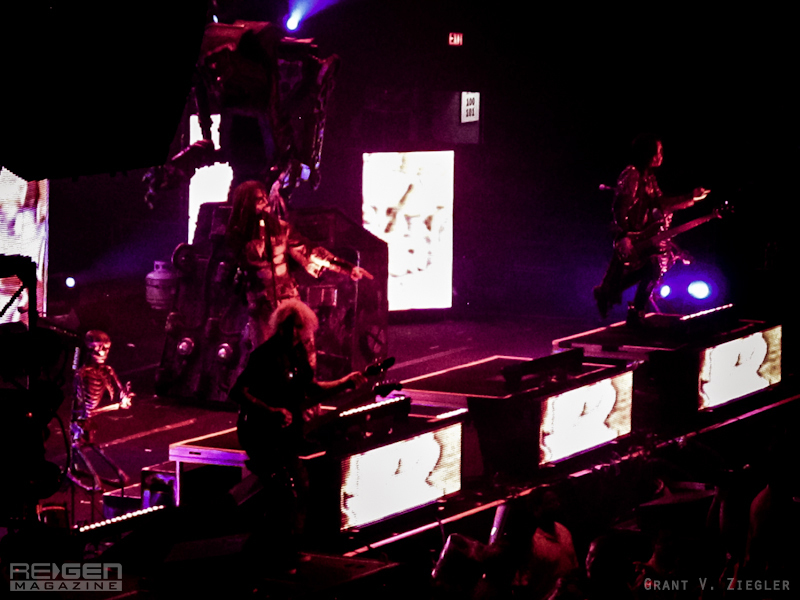 The stage was laden with larger-than-life beasts, monsters, and robots strolling about the stage for nearly half of Zombie’s set time. Zombie moves around quite well for someone his age; however, the overall Rob Zombie experience has slowed down with too many set breaks and guitar solos taking away from the overall concert-going experience. 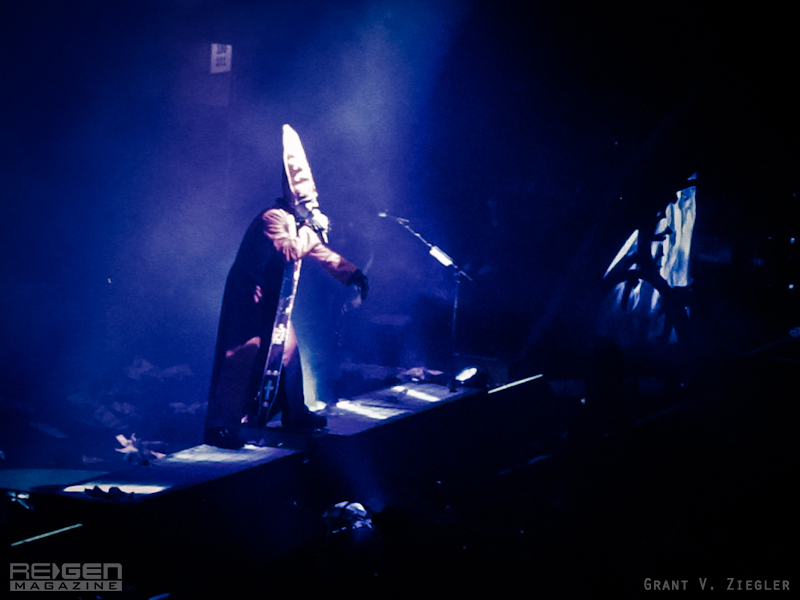 A fifth of the show seemed to be dedicated to Zombie’s guitarist (and former Manson guitarist) John 5. His godlike musicianship is second to none in the music business, but he was overused. It’s great that Zombie has a fallback plan anytime he wants to leave the stage, but at least two or three more songs could have been performed in place of guitar solos, Ginger Fish drum solos, and a shameless self-promotion of his new movie. If you want the head-to-head matchup, Zombie’s show put Manson’s to shame. Zombie actually remembered all of his lyrics and utilized all sections of the stage while Manson screamed and mumbled his lyrics and paced slowly across the stage. Unfortunately, Manson seems to be a shell of his former self and until his priorities are music and showmanship and not absinthe and beer, he may never return to the glory days as the “All-American Antichrist Superstar.” Overall, the show wasn’t really worth the money. Had the show happened 10 years ago, media would still be talking about how that was the greatest tour on earth. As it stands, the tour happened now as the decline in their musical careers is becoming evident. Marilyn Manson’s Antichrist Superstar and White Zombie’s Astro Creep 2000 are true industrial metal classics.Both artists never amounted to these gems afterwards.Manson and Zombie going mainstream…no please! !Back to the roots, fellows.That’s your only salvation.You have my blessing. I am a 64 year old fan, having been introduced to Manson by my son many years ago. I have seen many of his shows in Dallas and recently in Houston. I was disappointed to see Manson so lackluster on stage and appear so uninvolved in providing the audience what I know Manson can do; mesmerize, inspire and thrill. Cut out the Absinthe and get your mind clear, Manson. Don’t rest on your past performances. Your fans love you and know what you are capable of providing! You are a tremendous artist! Let’s see that Manson again!